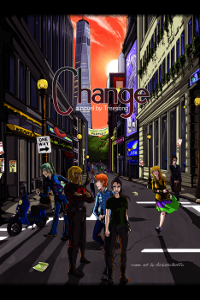 Review Copies: Booksellers and reviewers may contact us to receive a free ebook copy of Change. Please include the name of your bookstore or the magazine, blog, etc. where you will be submitting your review. Cover Art: The beautiful cover art for this novel was created by Acaisha Buffo. Kickstarter: This novel was made possible in part by a successful Kickstarter campaign.